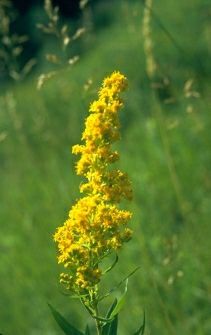 The goldenrod (Soldiago gigantea) was declared the state flower by legislative action in 1895. Numerous species of goldenrod grow throughout the state. The goldenrod is an erect, coarse-looking perennial herb that is usually about two or three feeet tall. The small flower heads, which are almost always yellow but sometimes have cream-colored or white rays, are grouped into either elongated or flattish clusters. The flowers appear from July through October. The resolution was signed into law by then-governor Silas A. Holcomb on April 4, 1985.